This beautiful four bedroom three bath ( one a Jack & Jill Bath) situated on the fourteenth floor of a new Phoenix Complex is ready to rent, use as a second home or permanent residence. No one has ever used the unit and it was recently furnished with up graded furnishings. It has granite through out with all tile flooring. 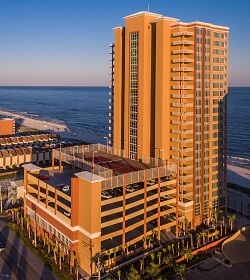 This top floor west end unit in the new Phoenix Gulf Shores has a view that is unbelievable; as far as one can see on a clear day. With four bedrooms and three baths ( one a Jack & Jill) you can accommodate your entire family and more. Each bedroom is designed to handle two queen size beds.